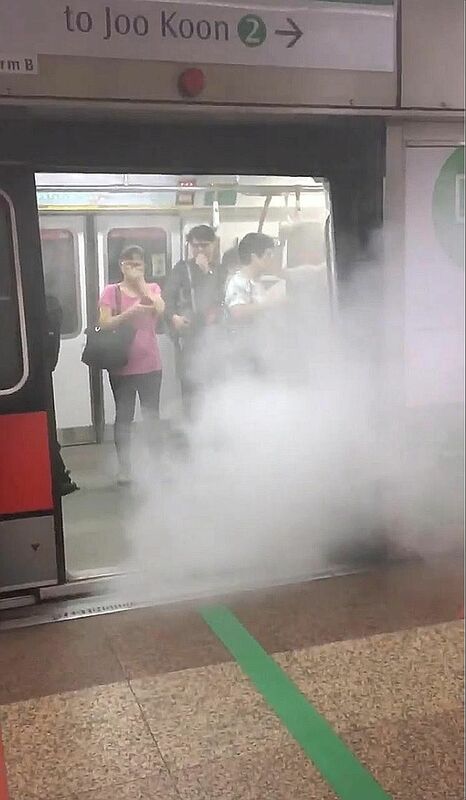 What looked like smoke engulfed a train at Tanjong Pagar MRT station and leaked out onto a platform yesterday afternoon, causing initial fears of a possible fire in the Central Business District. Videos of the incident showed commuters rushing out from what looked like a smoke-filled train. But it turned out to be a false alarm, with the "smoke" turning out to be freon gas leaked from the train's air-conditioning system. A common refrigerant or substance used in air-conditioning, freon gas is odourless, has low toxicity and does not catch fire. "At 2.53pm this afternoon, passengers at Tanjong Pagar MRT station were detrained from a westbound train due to a leak of freon gas from the train's air-conditioning system," said Ms Margaret Teo, SMRT's head of corporate marketing and communications. SMRT staff switched on the tunnel ventilation system immediately to disperse the gas, she said. The train was withdrawn from service, and its air-conditioning system is being checked, she added. There was no disruption as the passenger platform at Tanjong Pagar MRT station "remained in service during this incident", she said. "We apologise to passengers affected and will be investigating the cause of this incident," said Ms Teo. The Singapore Civil Defence Force (SCDF) said it sent its staff to the station to investigate, and no fire or injuries were detected. A commuter, who wanted to be known only as Zoe, said she was waiting on the platform when the affected train pulled into the station. "Huge plumes of smoke came out from the train the moment the doors opened. It filled the station really quickly as people started to evacuate the train," said the 27-year- old, who works in sales. She said an SMRT staff member appeared on the platform shortly after and "asked everyone to stop taking photos and videos". The gas lingered in the station. Many commuters, including Zoe, boarded the next train. Ms Sophia Kee, 30, an environmental designer who was on the affected train, said the "smoke" started to fill up the train between Raffles Place and Tanjong Pagar stations. It appeared to be "coming from underneath the train", from the gap between the train and the tracks, she said. There was "smoke" as far as she could see. She said it caused her to cough and passengers did not know what to do when the train stopped and its doors opened. "We did not know if it was more dangerous to be on the train or off the train," she said, adding that she did not hear announcements telling passengers what to do. In January last year, former transport minister Lui Tuck Yew had said in Parliament that MRT trains and tunnels were designed with safety features to protect passengers should there be a fire or smoke. Underground MRT stations and tunnels, for example, have smoke extraction and tunnel ventilation fans to expel smoke and supply fresh air during a fire. He had said the Land Transport Authority (LTA) requires rail operators to have plans for passenger safety during emergencies, and officers trained to execute them. Their readiness to handle such emergencies is tested regularly by the LTA and agencies such as the SCDF and police.